I recently took a class at the Boston Center for Adult Education taught by Tony Maws, chef/owner of my favorite restaurant, Craigie on Main. Known for his nose-to-tail cooking and making use of every part of an animal, this class allowed us to work with foods that seem unapproachable - fresh uni - as well as the everyday - whole chickens. I first heard of spatchcock chicken from Nigella Lawson on one of her shows years ago. She was making birds on a grill and I guess I never really thought about using the same technique to butterfly the chicken and roast it in the oven. 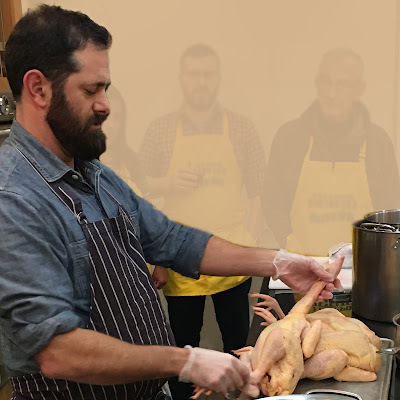 As part of the class, Chef Maws showed us how to break down a chicken, a technique I've seen many times and have attempted to varying degrees of success. He talked about finding good food sources and understanding where food comes from and how it's treated before it gets to the table. He also talked about avoiding food waste and using every part of the animal. Chef Maws also shared his favorite way of roasting a chicken - to spatchcock it. It's not that difficult to prepare, the chicken cooks more evenly so the dark meat is cooked through without drying out the breast meat, and it's much faster. Serious Eats has a fantastic video and step-by-step photos on their website that show you exactly what to do. Unlike the chickens that Chef Maws can get with the feet and heads on, I get a standard grocery store chicken. Since I don't have a local butcher I usually get my proteins from Whole Foods. Chef Maws showing us how to prepare a chicken. To prepare the chicken you cut out the backbone, spread out the bird and push down on the breast bone to flatten it. I cut off the wing tips before tucking the wings under the bird. It's not really necessary but there isn't much meat so I save it for stock. With a pair of kitchen shears or a good chefs knife, prepping the chicken is really quite easy. And thanks to Chef Maws I have a growing bag of chicken parts - necks, backbones, and wing tips - in the freezer to make stock. I used some of the lemon herb garlic salt that I made for the Food in Jars Mastery Challenge, added some cracked black pepper and olive oil to make a rub. After patting down the chicken with paper towel I rubbed the mixture on both sides of the chicken. Following the Serious Eats instructions, I preheated the oven to 500° F and placed the chicken on a flat rack on a foil lined sheet pan. I also took a lemon and quartered it and tucked it under the chicken for added flavor. I placed the pan on the rack in the upper third of the oven. My kitchen, unfortunately, does not have a window and has a poor exhaust system. I set up a fan to continually move the air around so as to not set off the smoke alarm. At that high heat and with the pan drippings, there's a lot of smoke. About halfway through I poured hot water into the sheet pan to help control the smoke. It took a little over 45 minutes to roast a 4 pound chicken. I used my instant read thermometer to check the temperature of both the thigh (175°) and the breast (150°) before removing it from the oven. I then let it rest for about 15 minutes before carving it. This was one of the juiciest chickens I've ever roasted and the skin was perfect. I didn't bother making the pan sauce in the Serious Eats recipe. I just squeezed the juice from the roasted lemons over the chicken. Absolutely delicious! I'd love to have friends over and serve them this chicken. I just need to figure out how to control the smoke. But even if I don't make this for anyone else, it makes delicious leftovers for sandwiches and salads. So thanks to Chef Maws I now have a new method in my repertoire and one that I plan to use often. *Although I had permission to take pictures of the class and Chef Maws, I didn't ask for permission to use my classmates hence the poor attempt through Photoshop. Thanks for visiting my little food journal. I'm a tech geek by day and profession but my thoughts and heart belong to food. I look forward to sharing my experiences and adventures with you and maybe even a few recipes. I hope you enjoy them. I'd love to hear from you!